You may need to rough up the surface of the PVC with some sandpaper if it does not hold well to the pipe. It might be our climate here, but we've never had any lasting luck using hot glue on PVC pipes either, even when it has a good roughed adhering surface. With the surface preparation, hot glue can last a little while, but we always have to come back and spend time repairing it. We've tried it all, wire ties, adhesives, even velco strips. RTV does work better because I think the issue is that the pipe expansion and contraction associated with temperature changes is just too dissimilar with a more rigid adhesive. In the end, we've just resorted to color matching PCV (Electrical) tape. I've never attached them to PVC, but I've successfully attached to 3/4" pallet strapping material. I used 3M #5952 VHB double sided tape after prepping both surfaces cleaning first with rubbing alcohol and then final prep step with 3M #94 Primer. Going on 3 years now and only needed to repair 1 strip that lost adhesion but I'm going to chalk it up to poor surface prep. Been very easy to store as I can just roll up the completed strips in large loops and put away for the season in a Rubbermaid container. Its a lot of work to put it together, and you need a lot of floor space. It's been difficult to find anything that will more permanently bond with the silicone sleeves. I agree on roughing up the surface first. Have you looked at the pixel mounting strips from Boscoyo Studios? Yes, the strips are designed to hold bullet-style pixels, but they work just great for holding ribbons too. That or some 3M 5200, that's Marine grade below water as is 3M 4200 waterproof but the 5200 will secure them like a rock where the 4200 will still be a little pliable. I use both for almost everything. Just remember the 5200 will have to be chissled off. The 4200 or 5200 should work, I am a boater and have applied 5200 under water. If you put a good dab on the pvc surface first then push the strip in. Read the temp rating but you are probably doing this inside. 5200 is almost like JB weld. I tore up my center console trying to get my depth finder mount off. Took gelcoat and all. 5200 can be had at Home Depot, 4200 is a little harder to come by, even my Marine supply 3 miles from my home doesn't carry 4200. If you have light strips in a silicone tube the only thing that will stick to both surfaces is more silicone. Get some clear silicone and prep your surface with rubbing alcohol or denatured alcohol. I've done this many times and it works very well. I have been looking into using aluminum u-channel stock. I own an alarm company and the stakes we use I placed the CCR into one and they fit snug, I think they will be easier to mount up on the tree pole one at an time plus storing away. The only thing I have not came up with is a easy answer is someway to keep them secured in the channel. One thought was drilling in from the sides to place some type of cotter pin to secure from blown or falling out, Well that's my thoughts Have a Merry Christmas Folks, you deserved it for lighting up our neighborhoods and bring so joy to those who were able to see it and enjoy it. the issue isn't the glue or the PVC it is the silicone. can't remember at the moment but there is a discussion two years ago about the same issue. there is a liquid that you can apply to the back of the strip then silicone glue the strip (just can't remember the name of the stuff at the moment). I used a thick super glue to attached some strips to corrugated plastics. They're sticking pretty good after 2 season. You could probably pull the strips off somkewhat easily but the gluye is holding. I used Gorilla supper glue and also their clear "repair" tape which can be used outdoors. About every 1.5ft, I did a wrap around the corrugated plastic and strip, just incase the glue popped in in places. I've also used the 3m 5200 in my water gardening hobby and it will stick to materials that many glue won't. There is one more suggestion. In the automotive / body shop they use a double sided tape from 3M that has a red backing to it on adhering such parts as molding. I use it for attaching our yard signs to their stakes and it holds very well and were in the mid-west with the weather we have again it holds up. Not sure how easy to get ribbon of if need to repair. I will try it before the end of our weather season and post my findings. As I said a couple days ago, I just use silicone. 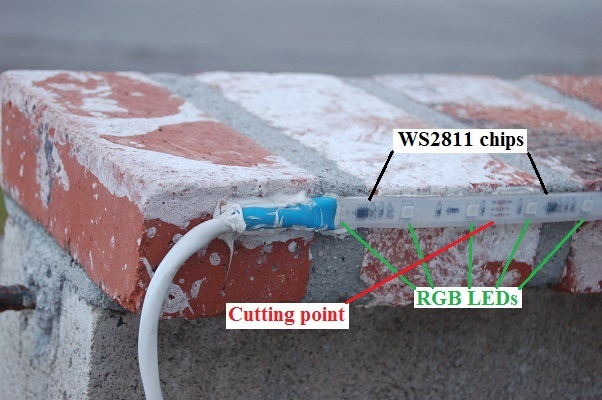 I have something close to 50 meters of RGB strip with the silicone tube glued in place for my year round landscape lighting. Most of that has been there close to five years in rain, sun, sprinklers without any issues. All of that is glued to brick. Of course the silicone sticks to the porous brick very well, and I've never had any of the silicone to silicone joints fail. Here is what I do to glue the strip in place. I first apply silicone to the back of about six inches of the end of the strip. I then press it into place and hold it there for about five (boring) minutes. If the location allows me to clamp that first segment into place, I do. For example, in this photo, it was fairly easy to use a C-clamp or two to hold the first few inches rather than having to hold it by hand. Obviously, clamp VERY GENTLY!!!!!! After the first few inches have set up for at least five minutes, then I apply silicone to the next foot or so and press that into place. Each segment needs to be held for about a minute and then you can move on to the next segment - making sure NOT to pull on the previous segment (or else you will pull it off). It is important not to put any mechanical stress on the freshly glued joint as it takes quite a bit longer for the silicone to fully set up. Once the last segment is in place, like the first segment, I will hold it for at least five minutes - or preferably clamp it. Then let it cure for an hour before trying to position the cable or cables. both you and I told them what WILL work, but people keep chiming in with off-the-wall experimental suggestions. Not much will stick to silicone except for more silicone. Clean the areas with alcohol first. As a mechanic I work with silicone on a daily basis and I found that prepping with alcohol is the key for a good Bond. BTW, one more thing. In my first post I specified GE Silicone II. Some of the silicone blends will leach acetone as they cure. Acetone is quite acidic and is very bad for your electronics. The smell is quite obvious if you've ever smelled acetone. Although for this specific application, the acetone would most likely not be a problem (because it's outside of the silicone tube), save yourself future trouble and ONLY keep the non-acetone producing silicone in stock. The GE Silicone II does not cause a problem. Note that GE Silicone (without the II) DOES leach acetone - get the stuff with the II which does not. if it works out good then ill buy the home depot tube, I have the gun, thanks! that is a bit pricey. And a caulking gun is a lot easier to control. As far as I know the "OP" asked for help, Its an open forum and when you ask a question you will get as many different answers as there are products. in no way shape or form were my replies were "off the wall experimental". As a matter of fact every comment posted here is a means to get to the OP's bottom line, secure their light strips to pvc or what have you. Coming on here bashing others or the OP for not just accepting your idea is just not the way to go about things.